Our birds have rescued us from snakes on many occasions. Magpies, butcherbirds (both the pied and grey species), noisy-miners and others have all played a part at one time or another in keeping us safe. Most of the time we do not have a camera in hand to capture a photographic record of the event. But on a few occasions we have been lucky enough to be able to do so. 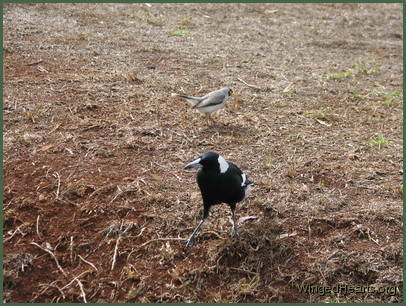 Readers who read my first blog post in this 30 day challenge on 'Inter-species friendships in Birds' will remember them. Maggie who was always happy to see me squawked as if I had deeply offended him. At first I felt really strange listening to his reaction, but when I followed his actions, I realised that there was snake lurking in the grass nearby just where I was heading towards. Maggie was actually trying to stop me from going there. 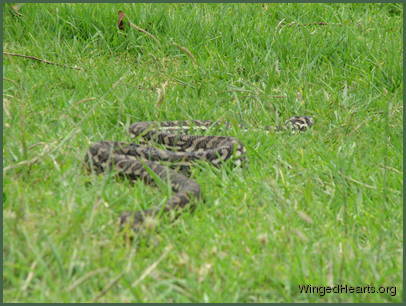 I ran inside and got the camera, by then the snake had moved into the long grass. The snake was a carpet python (more commonly called a tree snake) which fortunately is not deadly to humans. But it can eat birds and I have seen photographs of it eating an adult magpie. Sorry for mentioning this gruesome detail, but I did want to make the point that they are an immense danger to the birds. So when Maggie and his family came over to chase the magpie out of my path, they were being very brave indeed. Maggie put himself between me and the snake. While Minnie and her family, Vicky and her kids squawked and chased the snake away. Click here for the slideshow. Magpies, butcherbirds and noisy miners are generally misunderstood and not very popular birds - all for different reasons. In recent years more people have begun to understand them and attitudes are changing. Some of my readers who have befriended these birds have commented that their yards are also generally free of snakes. Australia has some of the most poisonous snakes in the world. The brown snake and many others are commonly found around the yard when you live in the countryside. When the birds see you as their friend, they reciprocate and look after you as well. If you would like a copy of the 23 Amazing Facts About Wild Bird Culture with true stories - click on this link and enter your details.